Identify, discuss and solve EOS® Issues like a boss. Your company's Issues are no problem! Adding Issues has never been easier. Use our mobile app, texting actions and Context-Aware Issues™ at a moment’s notice. No more messy Issues Lists. Organize your list by priority, owner or date. Top three items automatically jump to the top for easy IDSing™. Add detailed notes, take To-Dos, move an Issue to another Level 10 Meeting™ and close an Issue—all from the same spot. Get to the root cause! Traction® Tools software for EOS makes IDS more effective and more organized than ever before. Add Issues on the fly from your phone or during the Level 10 Meeting. Schedule your Free Trial and see how easy it is to Identify, Discuss and Solve your issues.Our Context-Aware Issues make it easy for your leadership team to create, update and close Issues in real time. You can even text items to the Level 10 Agenda at any time, from anywhere. 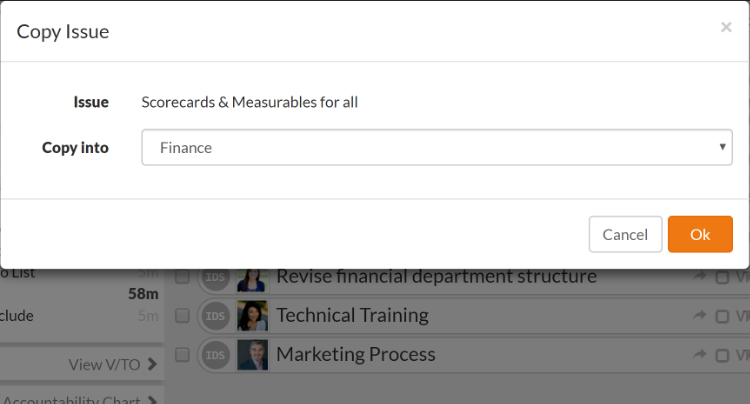 Once you’ve added an item, you can view it in your Traction Workspace™, Level 10 Meeting and the mobile app. Managing your most difficult Issues is a snap! Organize the Issues List any way you like—by owner, date or priority. Your top three items automatically jump to the top of the list so you can IDS them without searching through a long list. You can also move an Issue to another Level 10 Meeting™ with just a couple clicks. With Traction Tools, your team might even solve more issues. At the end of each meeting, you’ll see how many issues your team solved. If you consistently IDS a low number of items, that number can be a great motivator to help your leadership team stay focused during the IDS portion of the meeting! After implementing EOS, we wanted an easy system to keep track of our Issues and To-Dos. Traction Tools has been instrumental in managing those tools and it is always getting better! Traction Tools is a simple, intuitive and organized way to run a team meeting and identify, discuss and solve issues.